Bisterne is a hamlet on the Christchurch to Ringwood B3347 road in Hampshire running parallel to the eastern bank of the nearby River Avon. 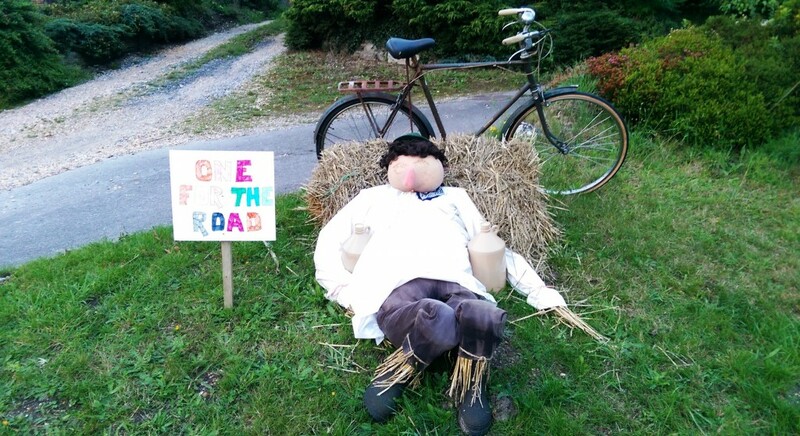 It holds an annual ‘Bisterne scarecrow festival’ which in 2015 runs until 1 September. The annual appearance of these human-like effigies at the side of the road is one of the first signs that the season is moving towards late summer and one of the earliest signs of an encroaching Autumn. In Britain, scarecrows have been used as protectors of crops and guardians of the harvest since time immemorial, and have local names such as ‘hodmedod’, ‘murmet’, ‘hay-man’, ‘tattie bogal’, ‘mommet’, ‘mawkin’, and ‘bwbach’. Bisterne is notable in English folklore for being the supposed location of a dragon slaying, a creature known as ‘The Bisterne Dragon’. The battle took place in Dragon Field at Lower Bisterne Farm, and is relayed here and here. The village inn of Bisterne (closed 1873) was called the Green Dragon. Bisterne is listed in the Domesday Book of 1086 as Betestre. More on the manor of Bisterne and associated dragon legend here at British History Online. The gentleman below, who has many scarecrows displayed outside his property, lives in the aptly named ‘Dragon Cottage’. Below is the garden at Dragon Cottage. Below, scarecrows outside Dragon Cottage. The gentleman from Dragon Cottage, whose name I unfortunately did not obtain, is father-in-law to the current world darts champion, Scotty ‘Dog’ Mitchell, and a suitable scarecrow of his world-beating son-in-law is included at the front of the cottage, in the photograph below. He is also sponsored by a brand of darts known as ‘Red Dragon’. Thank you to the lady and gentleman from Dragon Cottage, Bisterne, for their hospitality.